Trending at $17.69Trending price is based on prices over last 90 days. Species Essentials Nutrition Chia Seed Omega-3 & Fiber - 340 g/ 12 Fl. Oz. Trending at $19.00Trending price is based on prices over last 90 days. Trending at $60.34Trending price is based on prices over last 90 days. NUTRITION ESSENTIAL PROBIOTIC SUPPLEMENT DIGESTIVE and IMMUNE SYSTEM SUPPORT! 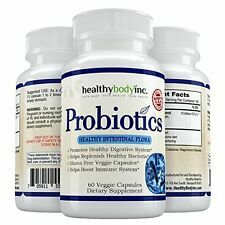 5 product ratings - NUTRITION ESSENTIAL PROBIOTIC SUPPLEMENT DIGESTIVE and IMMUNE SYSTEM SUPPORT! This page was last updated: 25-Apr 13:07. Number of bids and bid amounts may be slightly out of date. See each listing for international shipping options and costs.